As we work to create family traditions that will take us through the many years of our marriage, I would be thrilled to pieces if this could be one of them. I love the Willow Tree Nativity Scene. They fit right into my Christmas decor theme/scheme and I find the craftsmanship to be brilliant. I would find it equally as brilliant if you would purchase a piece of the Nativity each year, for me as a Christmas gift. Over the many years we are sure to be married, I will eventually have the full collection - and also the many memories associated with it. While I wholeheartedly realize that I can purchase the nativity for myself, I want to provide you with the opportunity to create a tradition for us and the opportunity to give me something that I truely want. What are some of your favorite Christmas Traditions? How have you maintained following them over the years? On December 4th, I'll be participating in Scrappi Jessi's Christmas Cookie Blog Swap - so be sure to stop by and enjoy the yummy goodness as we make our way across the internet world to see each others fun and tasty Christmas Treats! Then, on December 12th, I'm participating in Karla's "What do you love about your holiday home" Blog tour! Each of the participants will share their holiday home decorations! I've told Steven that I absolutely must have a wall up and dry so that I can decorate that part of the house. Oh the holidays are HERE! Christmas music is going in the car, on my iPod and on the stereo when I'm at home. YAY! I’m a huge – no massive – fan of multi use cooking. Meaning, I love (and work hard) to cook once and serve multiple times. But, no one wants to eat spaghetti for days in a row. In fact, I’m lucky if I’m able to get Steve to eat the same meal two days in a row. So, it’s not unusual for me to try and dream up creative ways to use our leftovers. One of our favorites is Spaghetti Subs – but that’s a recipe for another day. Preheat your oven to 350. Place a piece of parchment paper onto a cookie sheet (this will aid in clean up later). Mix the turkey, stuffing, potatoes, green beans, and cheese together in a bowl. Roll out your pie crusts and cut out 2-3” circles with a biscuit cutter, or cookie cutter. (You should be able to get 9-10 circles out of each pastry crust.) Use some flour if your cutter is sticking to the dough. The filling makes quite a bit, so generally I’ll stop after making 40 or so. If I’m feeling particularly frugal, I roll out the pastry scraps and cut out more circles rather than throwing them away. Put about 1 tablespoon of the leftover filling into the center of a pie crust circle. Using a pastry brush (or your fingers if you don’t mind getting messy), brush a bit of egg around the bottom half of the circle and fold the pastry circle in half. Using a fork, crimp the edges of your pastry crust pocket to seal. Place onto your cookie sheet. .
Once the cookie sheet is full, brush each of your empanadas with a bit of egg (this will make them shiny and golden brown when they’re done). Put the cookie sheet into the oven and bake until the empanadas are golden brown. Don’t forget, since these are all leftovers, everything is already cooked. You’re just warming everything up and cooking the crust! Because there is quite a lot of filling, I froze what was left in 2 cup portions to use for another day’s meals. I know the kids really loved these, and so having the filling on hand will be great when they’re over studying for finals, or when my grocery budget is shot and they’re over to hang out. Before Silver Bella, there was Jingle Bella. In my searching for more information about it, I came across this recipe from the fabulous McFoof herself’s blog – and my life has not been same since. Neither has my waist line, but that’s another story! After sharing some of these tasty treats with friends, I’ve been asked (and begged) to share this easy peasy recipe. I wouldn’t dare be the one to ruin your holiday treats, especially with one so absolutely easy! I’d imagine that this would be an ideal activity/treat to do with young(er) children as they can unwrap the candies you use and help you smoosh the M&M’s in too. Enjoy! Place a piece of parchment paper on a cookie sheet (this may save you cleaning time later!). Place pretzels on cookie sheet, making sure they’re all flat and not laying all over each other. Then, place an unwrapped Hershey's Kiss on top of each pretzel. Bake pretzels for about 4 minutes; just enough to get the chocolate to melt. Too long and the chocolate dries out and won't cooperate. Take the cookie sheet out of the oven, and set it onto something to protect your countertops (if that is something you need to worry about). Then, individually press 3 M&M's into the chocolate to fill in the holes. Then, slide the parchment paper onto your table and reload your sheet or refrigerate to set the chocolate. Yummy. Simple. Fast....gotta love it. I’ve tried this yummy treat with Reece’s mini peanut butter cups (SOO yummy). They’re a little messier because of the peanut butter, but tasty none the less! This year, I used Rolos and pressed a pecan half into the softened chocolate for a turtle pretzel! Yum! turkey_stuffing, originally uploaded by heather_ales. Ahhhh the infamous Crockpot Stuffing. I was SOOO happy when I found a version of this recipe a few years ago. Seriously. Color me happy. Stuffing is a basic staple of Thanksgiving dinners everywhere. and most definitely at my house. Not having stuffing would be like, not having dessert on a birthday. Just plain wrong! Anyway, as any Thanksgiving cook knows, oven space is especially tight on Thanksgiving (unless you have two ovens – I haven’t had that luxury!). I don’t cook my stuffing in the turkey (the timing always throws me off), and have always done it in the oven. Finding this recipe was a serious God send. It’s easy, keeps my oven free, and is very tasty. It’s one of those recipes that you need to adjust for your altitude and climate (warmer/drier climates would use more broth, cold/wet climates would use less). If you have a newer crock-pot (I find they cook a bit faster), periodically check on your stuffing to make sure it’s not cooking faster then you want. You can find this recipe (and many of my other favorite recipes) on my cooking blog at www.frommykitchentoyours.blogspot.com. A link right to this recipe is http://frommykitchentoyours.blogspot.com/2006/11/thanksgiving-2006-crockpot-stuffing.html. I have a bunch of new recipes to add, and plan to do that this weekend! Wahoo! Enjoy! I'd really love to know what you think of it! Let it Snow Preview, originally uploaded by heather_ales. Wow - so many great questions, awesome ideas, and fabulous tips! Thanks friends! I'm planning to answer all of your questions this weekend (or on Thursday while things are cooking away for our Thanksgiving Dinner). This photo is a piece of my November Maya Road Design Team project. You'll be able to see the whole project sometime this month on our blog. Maya Road Coaster Album, originally uploaded by heather_ales. So many of my sweet Bella friends had questions about using chipboard while we were toiling away in our fabulous Prima Bella taught classes last weekend. Suprisingly many of my new friends haven't used chipboard simply because they don't know what to do with it. Wow - color me suprised! I have the lovely honor of being part of the Maya Road Design Team. I know - lots of fun! As a result, I've done a bit of work with chipboard. In case you don't know, chipboard is an inexpensive thick board (like cardboard but much sturdier) embellishment that can be added to your art supply arsenal. It comes in a massive variety of sizes, shapes, and thicknesses. It can be purchased in sheets, pre-cut packaged sets, assembled albums, and a bunch of other ways.. When using chipboard, the main thing to keep in mind is that anything you can do to paper, you can do to chipboard (and even a few other things too!). - Stamp background patterns on your chipboard with paint or ink. - Put letters or numbers together to create a unique title.Try mixing up fonts and sizes for a totally different look. - Use chipboard to make frames and photo mats. - You can staple chipboard, paint chipboard, sew on chipboard, add eyelets or brads to chipboard. - Use negative chipboard pieces to stretch your alphabets! - Paint chipboard with metallic acrylic paints - then sand to get a distressed look. - Cover chipboard with patterned paper for a completely customized piece for your project! - Paint your chipboard piece. Once it's dry cover it with your favorite wet adhesive and then sprinkle glitter ontop. Talk about gloriously glittery! So... with all this chipboard talk, I'm going to share a bit of my Maya Road collection as Blog Swag. To win this lovely product selection, all you need to do is leave me a comment with either your favorite thing to do with chipboard, what you would like to learn to do with chipboard, or your reason for not using chipboard. I'll take entries through Sunday, November 18th. I'll have one of my glorious nieces or nephews choose a winner (of course it'll be over the phone, but I'll enjoy talking to them just the same). Thanksgiving Dinner Photo, originally uploaded by heather_ales. Surely someone else out there in blog land is proactive in planning their Thanksgiving meal. My friends and family often tease me about my menu - all in jest of course because when it comes down to eating it, they're ALL in. I've been thinking about what to serve and cook this year. And of course, what I'm willing to let others bring. I'm the kind of girl who loves to do all the cooking (I SO inherited this trait from my mother) and who normally tells everyone else to not worry about bringing a thing, I'l have it all covered. I'm trying to let go and let others enjoy bringing food too. Our friends ask us if they can come to our house for dinner (sometimes multiple times a week) and tend to have their feelings hurt if they're not regularly invited. I think I should take that as a compliment. Each year, I'm quite zealous in my holiday meal pursuits. Lots of everything - especially leftovers. (I've been testing out some new leftover recipes though. So far they're awesome!) We have this crazy tradition which I love. Every Thanksgiving each person who attends our meal gets their very own pie. Yes, a pie all of their very own. Normally I bake full sized 9" pies for each person. However, this year I smartened up and ordered 5" disposable pie pans from a great kitchen store. I'll be able to split each regular sized pie recipe into two seperate pies thus saving myself from baking a gazillion pies. YAY me! So tell me, what's your favorite thing to make or to eat at your Thanksgiving meal? Nurse Addy, originally uploaded by heather_ales. No, not for Steve and I! My fabulous younger sister Bekki Boo and her husband Shaun have blessed us with another child to spoil rotten! Gosh how I love those kids! What a gorgeous baby! Seriously! Addyson Celeste was born on my brother Roberts birthday (which means he gets to stay 29 years old forever - LUCKY!). She was supposed to make her grand appearance during Silver Bella on November 9th. However, like her other siblings (Arissa - 6, Michael - 4, and Ainsley - 2) she had to come early. I'm jealous of Bekki Boo - she arrived at the hospital just 20 minutes before delivering Addy. I guess when you go to deliver your 4th child, it's easy or something. She didn't even have time to get any pain medication - and she's a ER nurse. Talk about not getting any bonus points with that one! Sheeeesh! I'm just pleased as punch that Miss Addy has come to join our already crazy family. She's a welcome addition and as gorgeous as they come! A few weeks back, I asked for some creative ideas for my new etsy/craft fair venture. So many of you sent me wonderful creative responses, for which I am very grateful. I loved so many of them! Paper Divinity from Teresa, Charming Creations from Holly, Inspiring Creations from April - so many of them really. I had my mind set on one name, and started the design process for a logo and other miscellaneous store based grass routes marketing stuff. Then, Kathy J. mentioned that something in my request stood out. If you recall, I said I wanted to find a great name - something that would be splendid. She suggested going with the name 'Something Splendid." I immediately thought it was a fun and creative name, and started to percolate on the idea. Then, my mother, who is the most tender hearted person of all time emailed me to share that she really loved the name "Something Splendid" also, but didn't want to post it to my blog because she was afraid she would hurt one of your tender feelings (see she's so thoughtful like that). She thought it sounded like something I would say, and that it sounded like "me". And so "Something Splendid" it came to be! I've loaded a few small things into my etsy store which were remaining from the craft fair here at work. I don't know how to post a link from Flickr (as that's where I'm currently updating from), but there is a link in the right side tool bar directly to my etsy store. I have lots of ideas of things to add soon - including the Silver Bella soldered charms that so many of you asked for. The incredible Teresa McFayden has given me her permission and blessing in creating them - how amazingly sweet is that of her? Love that woman - seriously! So... Something Splendid is on it's way! Thank you for all of your great suggestions and fabulous ideas! I loved them all! Seriously. This is what I'm definitely doing for Christmas this year...it'll be so much fun, and so completely worthwhile. Artists should keep making art and the crafters should continue making crafts and the beaders should continue to keep stringing beads and the knitters knitting hats and the painters painting canvases. 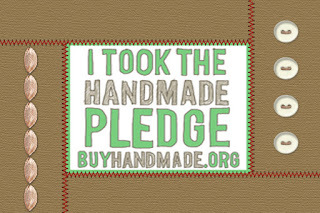 Let's all buy beautiful handmade works of art this year - no matter what kind of art. April '10 Update: WOW.... time has flown by! As I tell my students, practice practice practice makes perfect and my soldering is now scads better than it was in the photo on the left. I wanted to come and update this post with what I am now using 3 years after this initial post. I've taught enough classes and have personally soldered hundreds of charms, so I am confident in my suggestions at this point. Lately, I've received many messages asking me all kinds of soldering questions. I think they're probably all coming from the charms I made my Silver Bella Roommates and a few special friends (they'll be available soon in my etsy store) or perhaps it's the wine bottle charms my Bella friends and I put together for the Prima Bella's (that would be the Silver Bella Instructors). First, and foremost, seriously....I am SO just learning. I am not an expert, nor am I terribly skilled. My soldering is nothing like the gorgeousness that is the fabulous Sally Jean. That being said, I LOVE it, and have had a fabulous time learning and practicing. As I've been responding to messages, I've collected a blurb of information which I've been passing on. Rather than continually sending out the same information via email, I thought it was probably wise to post it here so that you can find it quicker (you know how slow I can be with email!). Another source, though they are not customer service savvy, nor are they knowledgeable (and if Robin isn't for some absolutely bizarre reason able to overnight speed ship the items you absolutely have to own TODAY), your local Hobby Lobby will have the very basic supplies - though they may hot be of the same caliber as Robin's (can you tell I really love Robin and her service?). Micheals and Joanns do not carry glass soldering supplies. You can also find a few items in your local home supply store (ie Lowes) or computer supply store (ie Frys) but you'll need to be very careful as those items are designed for plumbers, electricians, or computer workers - not for hobbyists or jewelry makers. Copper Tape - there are many, MANY widths available, and MANY different backs. I started out with regular copper backed copper adhesive tape. Soldering Iron Stand - This really isn't optional – believe me just do it. Your body, and furnture will forever thank you for buying one. It will alleviate the iron rolling or you accidently dropping it onto your legs or onto your beautiful furniture. Cheap-o paintbrush - A kids one will work fine – it’s for your flux. Qtips also work, but I think a small brush is better. Glass - Again, there are a lot of varieties available. Robin has some great sizes precut for you. I sometimes prefer to use microscope glass because it is so thin. (yes the actual glass just cut down to the size I need). Robin's glass is thicker, and is more durable = less likely to fracture or shatter (especially when learning). Jump Rings - if you’re planning to make charms or ornaments you'll need them. Floor Tile - A local store uses a silpat mat in their soldering class but I BY FAR prefer tile. Solder doesn't stick to tile. The silpats they used had some melted solder (duh... solder melts at 930 degrees!). I'd rather be safe than sorry. AND... the Silpats are expensive ($50). Tiles are either free (if they're left over from remodeling projects. Local gals - lemme know if you need a tile) or very inexpensive at your local home supply store. If you're giving a second guess to this, imagine what a mess (or a disaster) hot molten solder will leave on your craft table or on your grandmothers dining room table. See... I'm telling you - you're going to WANT this. Sal Ammoniac Block - This will help clean your soldering iron tip when it gets loaded with oxidation (from solder, flux, and adhesive) and will help keep it clean to use while soldering. Your solder won't stick to an oxidized soldering tip. I was REALLY frustrated until I learned about this block! Adhesive Copper Sheets - This is great to have when you don't want to solder two pieces of glass together. Instead you can use one piece of glass (normally on the front) and a piece of the copper sheet on the back. This allows you to solder the whole back piece and not just the sides. There are all kinds of other items you can add to your arsenal of soldering supplies and fun things to play with, the items above are just the basics. Soldering itself is pretty basic, but does take practice to get the hang of it. It's one of those things that you can watch someone do a million times and they can make it look easy. Once you sit down to do it yourself, it's seems like a huge challenge. If you're interested, leave a message, and I'll go into the very basics of soldering. I recommend checking with your local beading store to see if they offer soldering classes. I know that they do in my area. I've had a few requests to teach them locally, and eventually I might. I've tossed around the idea of doing here in my home (which would totally work out) but haven't made any commitments yet. 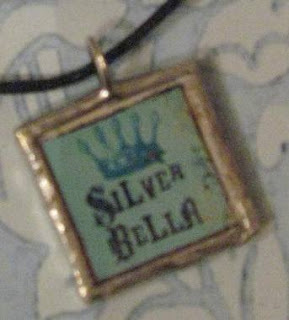 Silver Bella... Here I come! Did you know that I am a star fanatic? Yep, I am. I have been for as long as I can remember. While I was growing up, my family lived in Germany (17 years!). My father did a LOT of traveling (TDY to military families). I've always been a Daddy's girl (I'm a Momma's Girl too now though), and when we was away, if I felt particuarly lonely I would look up into the sky and know that he could see the very same stars I was. The same thing worked for me when I made my big move to the US. Despite being an American citizen, the US was a completely foreign country to me. My roommates couldn't understand why I found somethings so fascinating (Ramen Noodles and 24 hour Wal-Marts), and couldn't grasp the concepts of others (speed limits on highways). I missed my family and the familiarity of our life. Looking up at the stars was something I still had in common with my family (though in a different time zone/continent) and it brought me much comfort. I didn't realize until a few days ago, how much my love for stars has impacted my home decorating style. I'm still waiting to decorate and completely settle into our house. The rooms I'm dying to do are the ones in the middle of reconstruction (still missing the wall) so there are boxes of photo frames, wall decor, stars and other misc decorations in a corner in the entryway/front living room. I could easily have stars displayed all over our home. 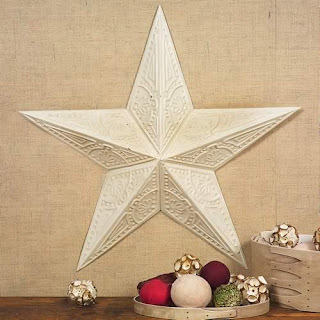 I especially love the barn stars and stars made with grapevines (my Christmas tree is actually almost all stars in red, gold, rusted metal, and ivory!). Really there was a point to this post, but it's escaped me at this point. Dang... I'm sure it was something earth shattering too. Perhaps even brilliant enough to bring us world peace and general acceptance of all things thrifty, glittery, and fabulous. 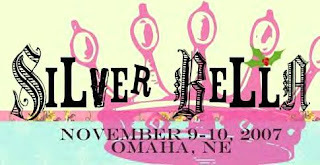 Maybe it had something to do with Silver Bella - it's only 5 days away and will be such fun! Valita and I did much thrifting in our attempts to find outfits for our Junk Gypsy attired evening on Friday. Mine is totally inspired by a photo I found on their website. We'll see how it turns out that night. I think big 'ole Texas hair might be appropriate. Hey, at least there's a reason to dig out some hairpieces. I'm sure they're around here somewhere!